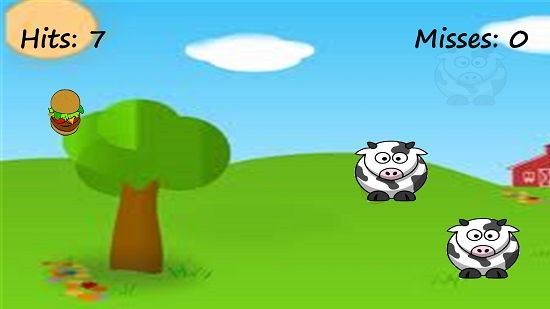 Cow Smash is a fun game app for Windows 8 and 8.1 which allows you to test your motor skills by rapidly bringing up pictures of cows on your screen which you have to click to smash them and score, and in this way you can test your mind’s motor skills. When you run the game, you will be taken to the main interface where you can start the game by simply clicking or tapping on the screen. Once the game has been started, you can then click on the cows which appear on the screen to smash them and score. The more cows you smash the higher the score. Cow Smash is available for free from the Windows App Store. When you install and run Cow Smash, you will be taken to the below shown interface. The above screen is the main interface of the game. You can choose to Start the game by simply tapping anywhere on the screen on touch screen devices, or left clicking on the screen in case of non-touch devices. Once the game has been started, you’ll be able to see the gameplay interface – a screenshot of which is attached below. In the gameplay environment, cows rapidly appear on your screen and you have to smash them by clicking on them rapidly. Once you click on the cows, you will be able to see them turn into burgers, meaning the cow has been successfully smashed. If you miss 3 cows, it’s game over. You can keep a track of your score at the top left and a track of your misses at the top right. Once it’s game over, you will see the below screen. You can then choose to restart the game from the above screen. This basically concludes the main features of Cow Smash on devices running Windows 8 and 8.1. 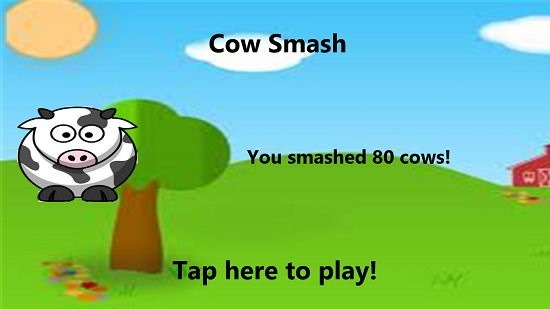 Cow Smash is a good app which allows you to test your motor skills and the speed with which your brain responds to sight. This app can be a good judge of how responsive your central nervous system is, and if you ask me, you should definitely give this app a go by heading over to the link below and getting it for your device!